We are a Christ-centered group dedicated to empowering homeless and at-risk single mothers to build a new legacy. Fellowship had a wonderful 2017–thanks to you! We’ve had an amazing 2017 here at Fellowship Housing. As the year draws to a close, we wanted to look back and say thank you for all that you, our donors and partners have made possible. Our program currently includes 18 moms and their kids. Because it’s a two-year program and women begin their Fellowship journey at different times, they don’t all graduate at the same time. This year, six moms graduated from the program. These amazing women are a success by any measure. Upon graduation, all moved into their housing of choice; five were able to begin renting a home, one moved into a Habitat for Humanity home. Collectively, these determined moms increased their salaries by a total of $63,092. They increased their savings by $74,870, and, most amazing, they paid off $287,354 in debt, and raised their credit scores by 521 points. The skills and strategies they learned during the program will continue to serve them as they provide a stable home for their children and move forward confidently in life. We’ve got exciting things in store in 2018, but we want to pause and look back at some of the highlights from 2017. 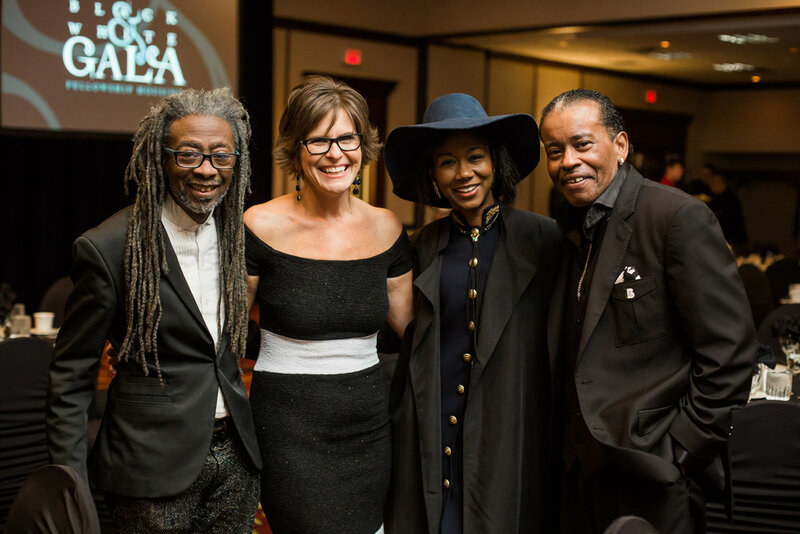 In February, we crushed fundraising goals (and enjoyed a magical evening) at our Black & White Gala. Sharon Irving provided music at the Gala. The final ten minutes of the evening were perhaps the most amazing of the evening. We set a goal of raising $25,000, which will support a single mom and her children for the full two-year Fellowship Housing program. Emcee Blaine Hogan kept up a lively commentary as donors used their phones to donate in real time. The total, displayed on the ballroom screens, grew steadily and within five minutes, we’d hit and surpassed the $25,000 goal. Within ten minutes, you all had raised $37,000! Altogether, more than $130,000 was raised that evening. It’s a stunning total that shows your generosity and dedication, and one that makes us feel grateful. Teens both near and far took time to help our moms, and inspired us in the process. Our student board is made up of 10 high school students, who are involved in a variety of ways, including putting on our Windy City Bulls night out. Sonika Menon, 14, of Naperville, is donating Birthday Boxes for the children who are a part of Fellowship Housing. Sonika, a member of our student board, recently created the Birthday Giving Program, a non-profit organization (complete with 501-3c status). With a little help from her mom, the organization provides Birthday Boxes to children who are living in shelters or are in housing programs like Fellowship. Another teen, Joshua Friedland, 17, of Long Island, NY, donated $300 that he raised on a GoFundMe page after deciding he wanted to help single moms. “After extensive research I found Fellowship Housing to be a charity that best helps single mothers in need, compared to some others,” he wrote. Our annual Golf Outing and Auction at Stonewall Orchard provided a fun day out on the links, a wonderful dinner, and a lively auction that everyone enjoyed. Together we raised over $100,000. Just two weeks before the golf outing, our new Event and Marketing Manager, Courtney Burton, joined the staff. Her boundless energy, creativity, and strong experience made her a great fit for this demanding role. She’s already helping us to get the word out about Fellowship in all kinds of new and creative ways. Also in August, our annual back to school picnic, once again sponsored by the generous team at Hoffman Estates Community Bank, provided a day of fun at SeaScape for our moms and their kids, and backpacks with school supplies for each child. In November, our wonderful partner Food For Friends donated Thanksgiving meals to all of our moms: each family received a turkey and food for side dishes. And all the moms and kids in the program got winter coats in November as well. The Chapel in Lake Zurich donated coats for all the kids in our program, and Hoffman Estates Bank President Georgeanna Mehr continued her annual tradition of providing coats for our moms. On December 1st, we held a Christmas party at Willow Creek Community Church for our moms and their kids. The evening included dinner, a Christmas cookie decorating station, multiple crafts from Craft a Community, and a visit from Santa and Mrs. Claus! Generous donors also provided gifts for the children in our program. We are currently finishing the year strong with our year-end fund drive. A generous matching donor will match gifts given before December 31, which means every dollar you give gets doubled. We’re just $19,500 to go to reach our goal of $65,000. If you haven’t made your gift yet, don’t miss the chance to have your gift doubled! Donate here. It’s been an amazing year, because of you! Thank you to every donor and partner for making 2017 an amazing year. We’re grateful for Food For Friends–and for you!